If you want the top of the line features and playback modes, the RC 30 is the cream of the crop. There’s only a small number of guitarists that have never heard about Boss, and most, if not all of them are beginners. This is a massive brand, a go-to company of every rocker, metalhead, and casual guitar player alike. 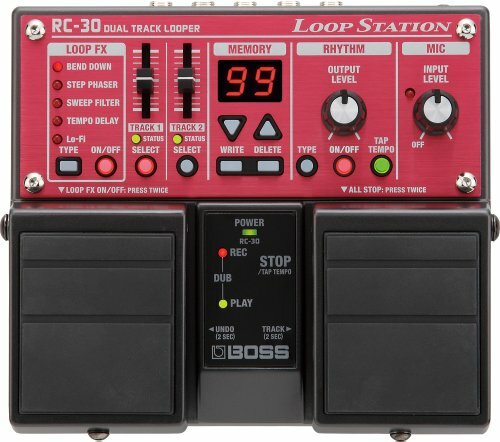 We’re reviewing the RC 30 Phrase Looper, which is more of a processor than a looper station actually. It has a massive footprint, two foot switches, internal memory that can hold up to 3 hours of recording time, 2 synchronized tracks, and a bunch of other things that guitarists can use to shape their sound on the spot. If this pedal doesn't fit your needs, be sure to check out our other looper pedal top picks. The first notable feature of RC 30 is that it has twin pedals onboard. There are also 2 stereo tracks, each having a dedicated volume setting fader, as well as the track select button. The general features include input and output level, tap tempo, and loop type, as well as the LCD screen, write, and delete functions. There are also 99 integrated memory phrases you can use to store your own loops, as well as five onboard loop effects. On the downside, this is not such a durable pedal since it has so many features exposed, so perhaps you should avoid using it live. Now, this is not by any means a simple pedal, mainly because it has loop effects onboard, including ‘bend down, step phrase, sweep filter, tempo delay, and Lo-Fi. The silver lining is that you can choose these effects with a click on the ‘type’ button, or simply not use them at all if they feel too complex for you. One of the best things about RC 30 Phrase looper is that it’s absolutely phenomenal for studio work. It has such a high level of versatility that you can play around with your loops for hours, if not days until you’ve nailed down the sound you want. On the opposite end of the spectrum, using it for live performance might easily become a nightmare since you’ll constantly have to worry about not stomping on the volume faders or the knobs. The silver lining here is that there’s a highly visible LCD screen as well as ‘on/off’ indicators, so with some practice you might be able to even use it in this setting. The big footprint will, however, take out a pedal or two from your rig in that case. Boss’ RC 30 Phrase looper is a very delicate pedal. It’s not so good for beginner guitarists mainly due to the fact that it comes supplied with such a huge number of features, but on the plus side, the features are fairly simple and well explained. It has a big footprint and it costs quite a lot, but it brings plenty of benefits to the table. All things considered, Boss pedals are among the finest, so if you know what kind of sound you’re looking for, the RC 30 will certainly help you find it and achieve it.